Vitamin D is a fat-soluble vitamin that helps you metabolize the mineral calcium to build strong bones and teeth. Your body can manufacture vitamin D if you are exposed to sunlight, so food sources aren't necessarily a big issue unless you live in a far-northern climate with long winters or spend all your time indoors. Although nuts and seeds offer other nutritional benefits, vitamin D is not one of them. Nuts and seeds are small packages of protein, minerals, vitamins, antioxidants and healthy fats, according to the Academy of Nutrition and Dietetics. Almonds, for example, are a good source of vitamin E and magnesium, while walnuts are loaded with antioxidants and alpha-linolenic acid, which is an omega-3 fatty acid. Chia seeds contain iron, calcium, magnesium and zinc. 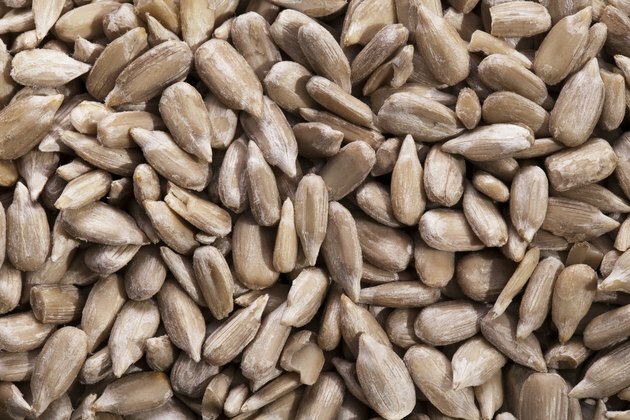 Sunflower seeds have lots of vitamin E and phosphorus, as well as vitamin B-6 and folate. None of these nuts and seeds, however, contain vitamin D. To boost vitamin D, get out in the sun or eat fatty fish and egg yolks, which are much better vitamin D sources than any nut or seed. Get Strong in 2019 Challenge Day 27: Do You Really Need Supplements?